Rumee A Hossain, EC Chairman of Bank Asia Limited and Director of Bank Asia Foundation, attended the higher education scholarship awarding ceremony of 76 meritorious students from Cumilla-Noakhali region at a function at BARD in Cumilla on Saturday. Md. Arfan Ali, Managing Director, Mohammad Ziaul Hasan Molla, DMD of the Bank and other senior officials of the Bank were also present. Fintan Byrne, CEO of CR2 (an Ireland based technology company) and Md. Serajul Islam, CEO of ERA-Infotech Limited, exchanging an agreement signing document to provide sophisticated software services to banks at ERA-InfoTech office in the city on Saturday. A. Rouf Chowdhury, Chairman of ERA-InfoTech Limited and also Chairman of Bank Asia Limited and senior officials from respective organizations were also present. 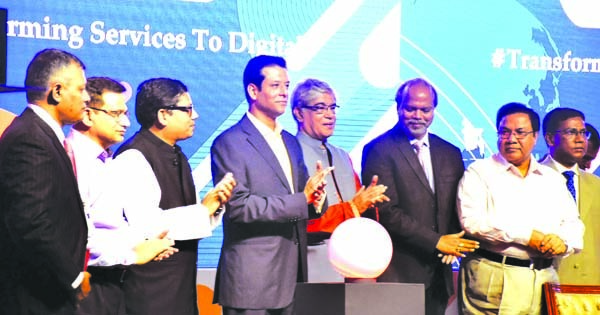 Emranul Huq, Managing Director (acting) of Dhaka Bank Limited and Khondaker Sabbir Mohd. Kabir, Director (Accounts & Audit) of American International University-Bangladesh (AIUB), exchanging an agreement signing document at AIUB main campus in the city on Thursday to pay the tuition fees of the university's student against a system generated reference ID through all Branches of the Bank spread across the country. Dr. Carmen Z. Lamagna, VC of AIUB and Md. Shafquat Hossain, Head of Retail Business Division of the Bank were also present.